Michael Trombetta, the trainer of 3-year-old colt Win Win Win, had a helpless feeling after Gladiator King broke through the gate as the field for the $125,000 Pasco Stakes was being loaded, delaying the start. But a horse with the kind of talent Win Win Win displayed in setting a seven-furlong track record has a way of making his connections feel like they’re just along for the ride, anyway. After breaking slowly from the No. 2 post, Win Win Win was taken in hand for the first part of the race before jockey Julian Pimentel launched his bid from the outside at the ¼-mile pole. Win Win Win surged past Gladiator King and Overdeliver, speeding to a seven-and-a-quarter length victory in track and stakes-record time of 1:20.89. Overdeliver finished second, followed by Cave Run and War Bridle, who was racing for the track’s fantasy-based “Tampa Bay Owners Club.” Jackson and Zenden were late scratches. 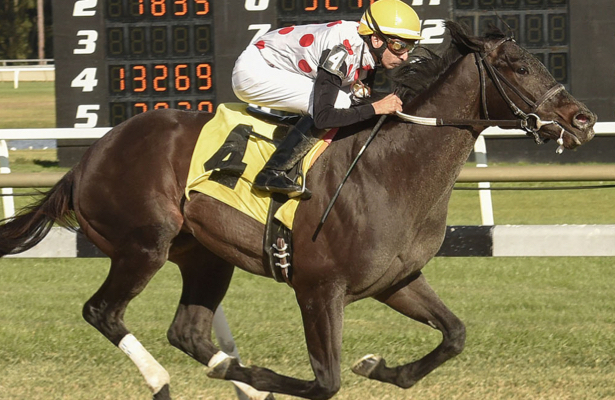 It was a record-setting Skyway Festival Day at Tampa Bay Downs, where 3-year-old filly Molto Bella set a stakes record of 1:22.20 in winning the $125,000, seven-furlong Gasparilla Stakes and 5-year-old mare Tapa Tapa Tapa established a new stakes standard of 1:43.27 in the $50,000, mile-and-a-sixteenth Wayward Lass (more on those races soon). Bred in Florida by Charlotte Weber’s Live Oak Stud and owned by her Live Oak Plantation, Win Win Win improved to 3-for-4, and Trombetta’s coy reply of “maybe” when asked if the horse would be nominated to the Grade 3 Sam F. Davis Stakes back at Tampa Bay Downs on Feb. 9 had a definitive air to it. Despite being forced to go wide on the turn, Win Win Win left his four rivals behind in a few quick, powerful strides in the 20th edition of the Pasco. “I didn’t panic (at the start) because he did the same thing last time,” Pimentel said of Win Win Win’s awkward start in a runner-up effort in the Heft Stakes at Laurel on Dec. 29. “He’s very quick, so I just took my time and let him do his thing. The winner’s share of $56,000 boosted Win Win Win’s earnings to $127,300. The son of Hat Trick-Miss Smarty Pants, by Smarty Jones, broke the stakes and track mark set in 2015 by subsequent Grade II winner Catalina Red as a 2-year-old (the Pasco was run that season on Dec. 27, 2014). El Grande Rojo had equaled the track mark the following year as a 7-year-old gelding. Recaps of Molto Bella’s Gasparilla victory and Tapa Tapa Tapa’s Wayward Lass follow.